A creamy custard sweetened with maple syrup and a hint of cinnamon spice, topped with a crunchy caramelized sugar coating. Preheat oven to 350F. In a small saucepan, heat cream and maple syrup over medium heat until small bubbles begin to form around the edges, remove from heat. In a large measuring cup, whisk eggs, egg yolks, vanilla and cinnamon. Slowly whisk in hot cream into the egg mixture until blended. Divide into six 3/4 cup ramekins. Set the custards cups in a shallow pan and place in oven. Pour enough hot water into the pan to cover halfway up the sides of the ramekins. Bake for about 30 minutes or until the sides are set but center still looks wet. Remove from water bath and cool on rack. Cover and refrigerate for 3 hours or up to 2 days. slowly heat the sugar until it bubbles and browns. Let the sugar cool to harden. 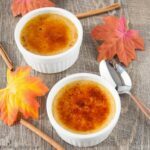 You can also use the broil feature of your oven to caramelize the sugar by placing the ramekins onto a baking sheet and broil as close as possible to the heat source until the sugar browns, about 30-60 seconds.